In an attempt to reduce the amount of plastic we use, I’ve been reviewing all my toiletries. I know already that I’ll decide not to replace some things; I’m very attached to my favourite beauty products! Because of this, I’ve been going for quick wins where I have no emotional resistance. Shampoo was first on my list. I have no particular brand preference but my dry, curly hair has to be washed, or at least dampened every day. Goodness knows what I do in my sleep but I always wake up with it sticking up like a scarecrow. The daily washing doesn’t help with the dryness though—although I rarely use a hairdryer so at least it’s not getting heat damaged too. My friend Jo suggested soapnuts as a solution to my packaging dilemma, and gave me this Soapnut shampoo bar from Living Nature to try. Soapnuts are basically dried husks of the berries from the soapnut tree. You can find out more by clicking here. They’re really good for people with excema or skin conditions that react badly to the chemicals in a lot of toiletries or laundry products, so if you or a member of your family suffer in this way they’re definitely worth investigating. The soapnut bar I tried is apparently suitable for the whole body as well as the hair, but I decided to approach it the old-fashioned way for this trial, and just washed my hair in the sink. The bar lathered up quite nicely and it definitely felt like it was doing a good job of cleaning my hair. What I hadn’t initially realised is that, as well as the soapnuts and Dead Sea salt, the soap bar also contains several oils (olive, coconut, palm and castor) which left my hair feeling really moisturised. I think if you have oily hair already, this might not feel so great, but it helped combat the frizz I get with my dry hair so was a real benefit to me. Other ingredients in the bar are essential oils of lavender, rosemary, cedarwood and cypress, so it smells gorgeous, slightly medicinal and woody. I think it probably goes without saying, but it’s also handmade, vegan and free of any chemicals. I really enjoyed this product and, given that the oils help with the dryness of my hair, it might have actually helped me to find a replacement for styling products too! Definitely a keeper…and it’s made me wonder what other soapnut products we could try. Have you tried any soapnut products? Or other packaging-free shampoo? I’d love to hear from you! 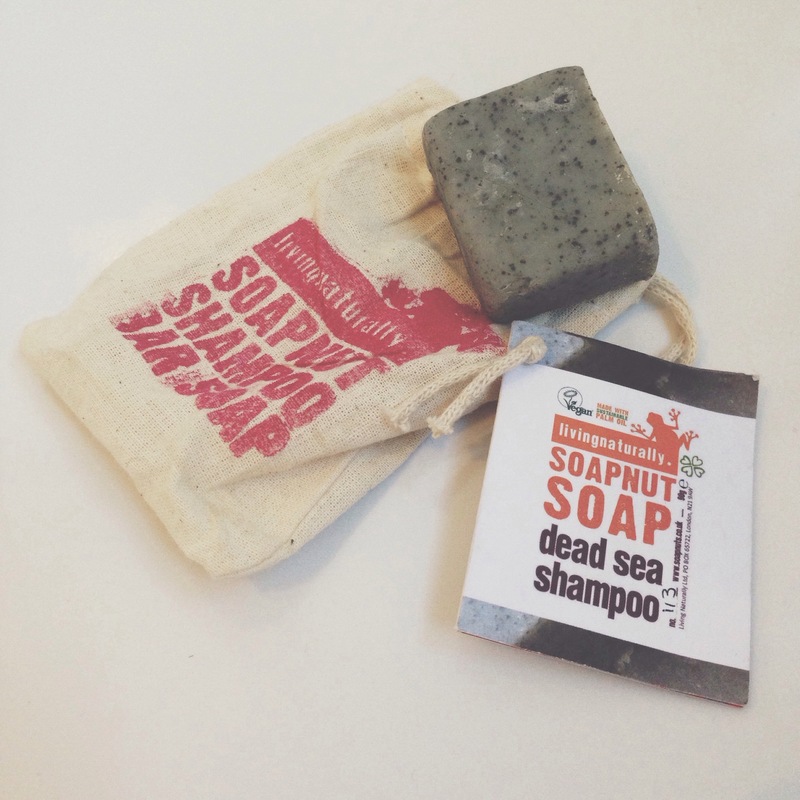 6 Responses to Living Naturally Soapnut shampoo bar. I’m intrigued… all the soap nut products I’ve seen have some kind of plastic packaging so I’m wondering – does this one? I’d love to find one that isn’t!